Red Velvet Cupcakes With Heart Candy is a great neighbor gift, teacher gift or for your sweetheart. Red Velvet Cupcakes With Heart Candy was a fun idea. I had signed up to bring snacks for Cora’s class party back in August at a parent’s meeting. Back in August, February seems a long time away. Well, it is February now and I needed to come up with a treat for the Valentine’s Day party. Do you remember Valentine’s Day parties when you were a kid? They were so much fun. My favorite part was decorating a box to bring in to the classroom to collect valentine’s. One year we had a contest and if I remember right, I was one of the top finishers. I know going to the store to buy a treat for the class party is easier than making one, but what if I told you these cupcakes were EASY to make. It all starts with a store bought red velvet cake mix and ends with a delightfully delicious candy. Every year, my husband and I eagerly await for the stores to put out this candy. It is Sweet Tart Gummy Hearts. They are good, they are flavorful AND they don’t use food dye in the candy. It is naturally flavored. They are delicious. Go buy some. You will be glad you tried them. They were a fun topping for this cupcake. They will add just enough sweetness and colorful, Valentine’s Day signature. The frosting can be store bought, this easy cream cheese frosting or a simple 3 ingredient recipe consisting of butter, powdered sugar and vanilla (recipe below). I hope to make the children happy. I do realize I broke a unwritten teacher rule though. I was a preschool teacher and the most dreaded treat to bring in was the cupcake. However, this cupcake was to delicious not to bring in. Sorry Cora’s teacher. I hope the crumbs are kept to a minimum. 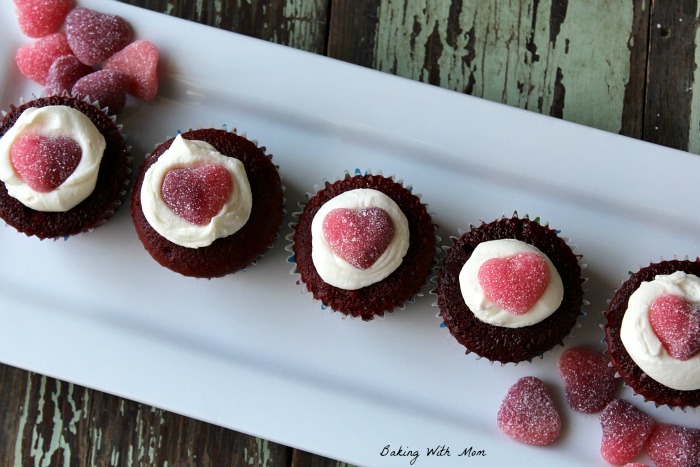 Red Velvet Cupcake With Heart Candy will be a Valentine's Day treat you will enjoy making as it is simple and delicious.